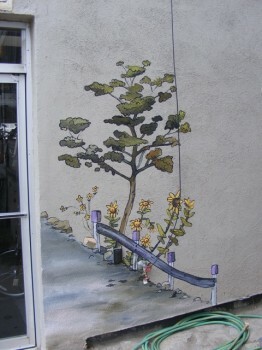 Oops, I forgot to update my webpage right after I finished this mural, one of my favorites, here in Prescott! I just realized it so I’m doing it now. 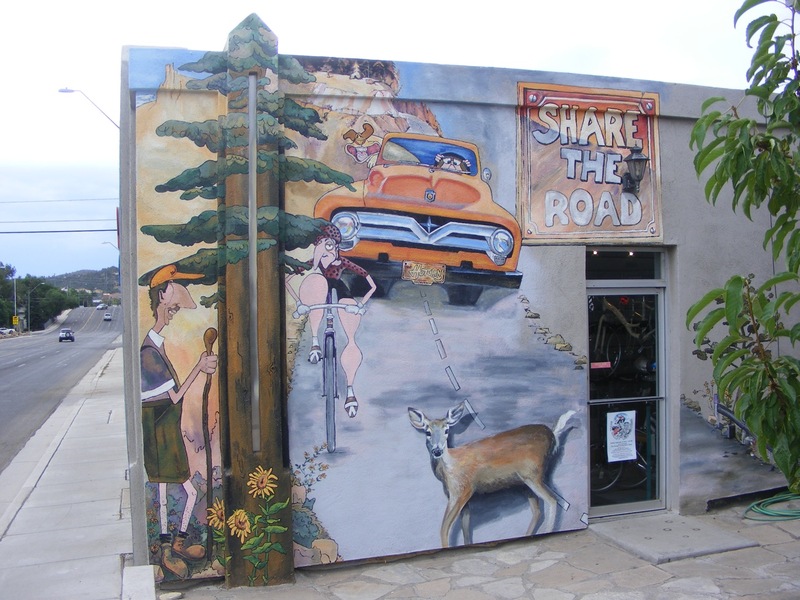 This mural is on the High Gear Bicycle Shop on Sheldon here where I live in Prescott. 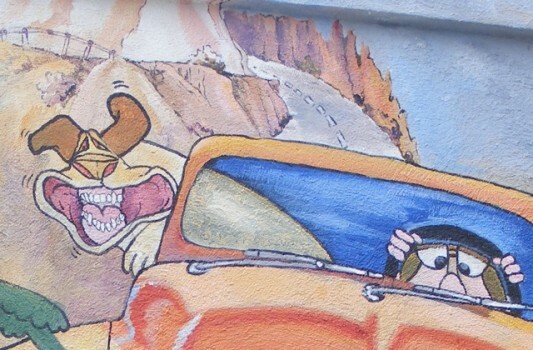 It is based on the cartoon movie “The Triplets of Bellville”, the trailer of which you can watch to see what the heck it is here: http://www.youtube.com/watch?v=P_LRQ6d9wdc It’s a cult bike classic. It looks like it was made in the 40’s, but it was actually made in, I believe, 2008. It’s about an obsessive bicycle rider and his momma and his adventures and misadventures trying to ride in the Tour de France. But be sure to come back to this page to see the art (or watch it after)! This was a particularly unattractive cement building with some weird architectural features on it, plus some old pipes and cords. I like to use the weirdnesses of buildings to incorporate into my murals whenever possible, to make what were negatives turn into positives. The “ponderosa pine tree” was this tall, strange cement sticky-out thing with a skinny glass window in it. It made a perfect pine tree base! There are pipes and cords disguised with paint. Some you can still see a bit, some are completely hidden. Can you find them? 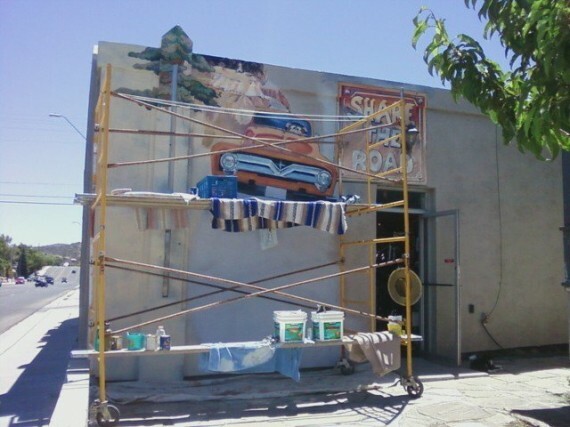 As for the color palate, I used colors in the movie that were compatible with the colors of Prescott and the neighborhood this mural in. 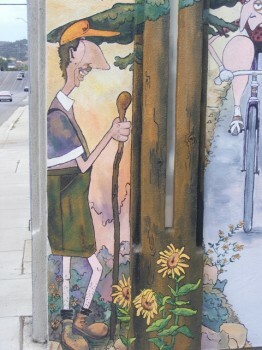 I wanted to make this community mural PRESCOTT. The trees and flowers are from prescott, the deer was one I nearly hit one day out by the Dells, the hill in the background is out White Spar, the hiker looks like a lot of hikers here in their cute little touristy hiking duds, white hairy legs and all. Even the car is a car that cruises around here, although I changed the color on it. And the little old lady? 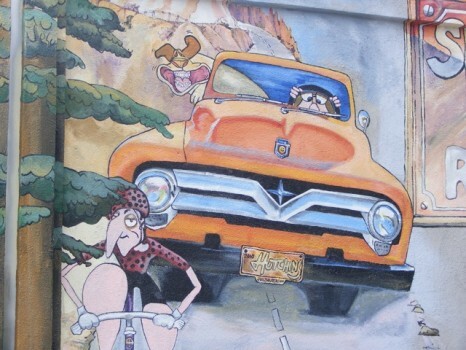 Who hasn’t here in Prescott seen ladies like her driving their big land yachts peeking under the steering wheel?